The thought of traveling with children can be daunting. But with a little preparedness, you too can be a calm and cool traveling parent. Below are a few tips to make your travel easier! •	If you are a nervous flier, make some preparations to calm your nerves and distract yourself during the roughest times. Be aware that kids will pick up on a parent's nervous energy and may become anxious also. For example, if you are unsettled during takeoff and landing, make that a time to engage in an activity with your child or read to your child so you are distracted. And remember that you may have to "fake it until you make it." Pretend that all is good and keep a smile on your face! •	Make sure to bring your child's favorite sleep helper....a toy or book that helps her get to sleep at night. And if your child doesn't have one, plan a special shopping trip to pick up some bedtime friends and books! •	If you want to avoid depending on electronics for entertainment, pick up a pack of playing cards or print off some puzzles for the trip. Mad Libs are also fun! Some of the most basic items can provide hours of entertainment, and kids often get fidgety when parked in front of electronics for too long. •	Let your child pick out a special piece of rolling luggage for himself. He'll have lots of fun packing clothes and items and pulling his luggage through the airport. Tasks that adults may find less appealing, like dragging luggage around, kids find enjoyable and fun! 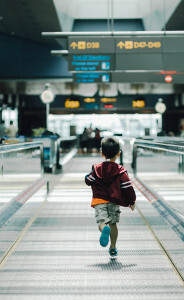 •	If you have a layover at an airport, give your child a small travel budget to pick out some treats. There's nothing quite as special as the item your child picks out and pays for herself! •	If you're traveling on a long flight, have some surprises available. Either wrap up a few new items or have a treat bag. The child can unwrap or pick out a special treat at intervals during the flight. •	Consider alternative transportation such as taking a train if the travel time isn't too much longer. Trains can be lots of fun for kids and allow them more ability to more around! •	Give yourself a day or two after arriving home to get back on schedule and settle in. If you arrive home at midnight and try to get to work and get the kids off to school the next morning, you will all hit a wall and be dragging the rest of the week. Or, plan to arrive home on a Friday so you have the weekend for readjustment. That way, you'll all be able to get back in the groove a bit better!